Since a week or so I'm a proud member of Etsy team 'In the Making', thanks to an invitation from Pey! Pey is the owner of Etsy-shop Peylu and co-owner of folkartvision. Her shop Peylu is one of my favourite shops since round about two years now. I love her paintings of birds and 'egg-watching' and those of - yes, furniture pieces, which is quite unusual. You have to check out Pey's shop! Her second shop, folkartvision, was new to me but is equally gorgeous. Here she and her partner Anatol sell beautiful and unique mixed media wood collages. Well worth a visit, too! The members of Etsy team 'In the Making' are some of the most excellent artists on Etsy - no girlie-girlie-plastic-stuff! Check out their shops, you will be surprised! The full membership roster you'll find here. The team's motto is 'Think different' and 'Thinking outside the box', something I always would support! 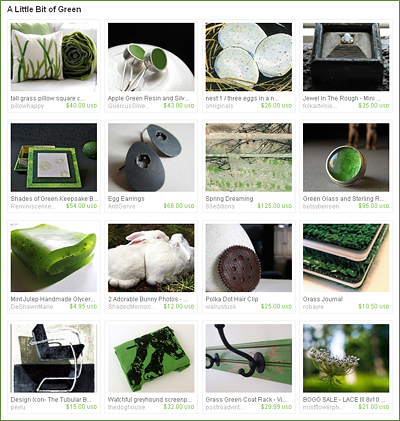 The team is creating stunning treasuries which you can find here. Or search Etsy's treasuries for 'imteam' or 'in the making'. As a small contribution I have created a treasury this morning, mainly featuring some team members (but some other great sellers, too!). And because I'm still in spring mood (hey spring, where are you today??!! ), it is about a little bit of green. Click on it to see the original with clickable items.